Munich - Hannover 96 completed a season double over regional rivals VfL Wolfsburg, Mainz's surprise bid for Europe continues in the wake of a clear-cut win at cellar-dwellers Greuther Fürth and, in another derby encounter, Borussia Mönchengladbach prevailed against Fortuna Düsseldorf. Hoping to bounce back from last week's tumultuous 5-4 defeat at Schalke and their recent slide down the table, Hannover started into the Lower Saxony derby with all systems go, launching numerous attacks on the visitors' goal. The Reds got their reward in double-quick time, too, Mohammed Abdellaoue finishing in style following a defensive slip-up from Simon Kjaer with all of three minutes played. Wolfsburg responded well to the early setback however, pressing high up the pitch and giving the hosts little opportunity to settle on the ball. Bas Dost, Ivan Perisic, Diego and Vieirinha all failed to find a way past excellent home keeper Ron-Robert Zieler, but when Sebastien Pocognoli marked his Hannover debut with a red card, it seemed like the tide might well be turning in the Wolves' favour. 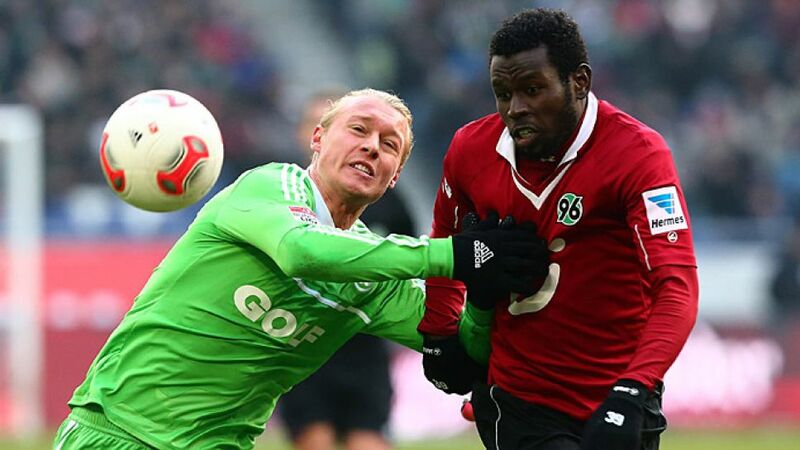 Instead however, the 2009 Bundesliga champions were caught cold shortly before the break, on-form frontman Mame Diouf doubling the 96ers' advantage. Naldo's two long-range efforts near the hour mark looked promising, while Dost and Ivica Olic squandered the guests' best opportunities a little later, coming up short with only the goalkeeper to beat. Surprise package Mainz maintained their upward momentum with an ultimately comfortable win at struggling Fürth. Second-half strikes from Adam Szalai, with a brace, and Yunus Malli wrapped up the points for Thomas Tuchel's troops and moved them up to fifth in the standings in the process. Fürth, still with just one solitary win all season, remain rooted at the bottom on nine points. Mönchengladbach took the honours in the Lower Rhine derby, with a 2-1 home victory over Düsseldorf that lifts them up to seventh in the table. Gladbach hit the ground running, albeit with a little help from the visitors. With just six minutes on the clock, Oscar Wendt picked up Juan Arango's pass down the left and fired a ball across the six-yard area that Düsseldorf central defender Juanan only succeeded in diverting past his own keeper, Fabian Giefer. Buoyed by that ideal opening, the lively Foals sought to press home their advantage and in the 14th minute they did just that. Tolga Cigerci blocked an attempted clearance by Fortuna's Johannes van den Bergh and the ball fell to Luuk de Jong, who teed up Patrick Herrmann for the simplest of close-range finishes.